Pleased to announce that the owner of this blog will be on short break for 2~3 days due to laziness sitting on her head! Hahaha... hey just kidding! Okey here's for you... a bowl of stir fried noodles, vegan style. Enjoy! Ingredients :~ shallots, garlic, fried tofu, mustard greens, carrot, yellow noodles, dried chilli paste, soy sauce, sweet soy sauce, sesame oil, little water, little salt, oil. Hehehe, didn't I inform you that I'm lazy right now! See you all around soon. 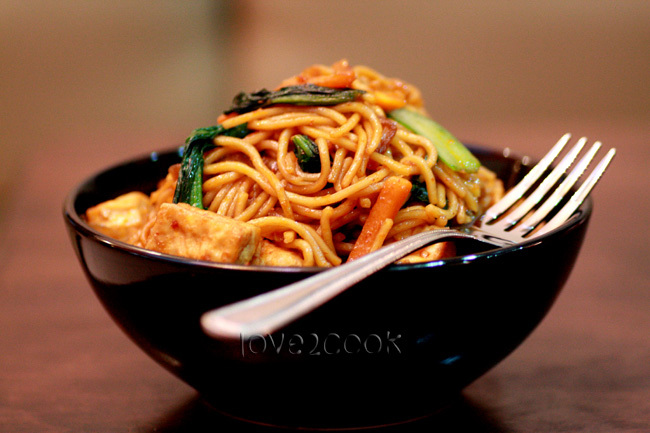 Noodles sounds delicious..outstanding recipe Love..
meh kita tukar2 nak..mee tu nampak sedappppnya!!!!!!! nak jugak!!! Noodles look lovely dear. Enjoy your break dear. i tak nak mee. I nak cheesy butter cake kat bawah ni. 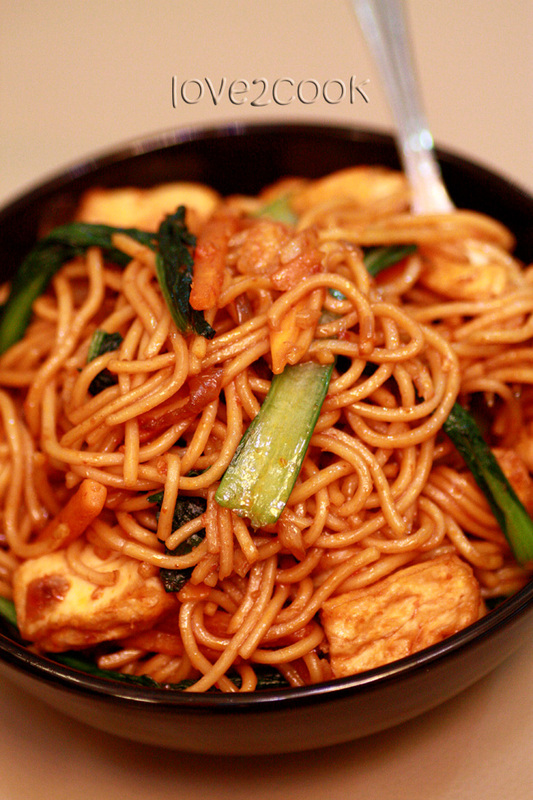 Seriously am hungry now,even after having my dinner...yummy noodles..
wow..noodles look just so yum...loved it ! Hi Love, waaaaaaaaa, are you going to Spa or what? hahahha...would like to join, can i? hehehe...Have a great days and be happy...muaaahhhh! 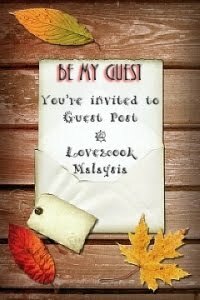 Nice blog, innovative!! in your cooking style, though some deviation from the norm. Should be tantalizing to the palate. Yummy noodles! Enjoy your break! Have fun! It looks yummy and delish! Even I stick to noodles when I feel lazy. It is definitely a comfort food. It looks yummy! Enjoy your break! Enjoy your break dear. Love noodles.